The US ambassador to Russia has condemned Moscow’s retaliatory measures to the proposed new round of sanctions by Washington. Earlier, Moscow decided to reduce the number of US diplomatic staff in Russia and halt the use of embassy storage facilities. US Ambassador John Tefft “expressed his strong disappointment and protest” at the Russian retaliatory move on Friday, as cited by Russian news agencies and Western media. 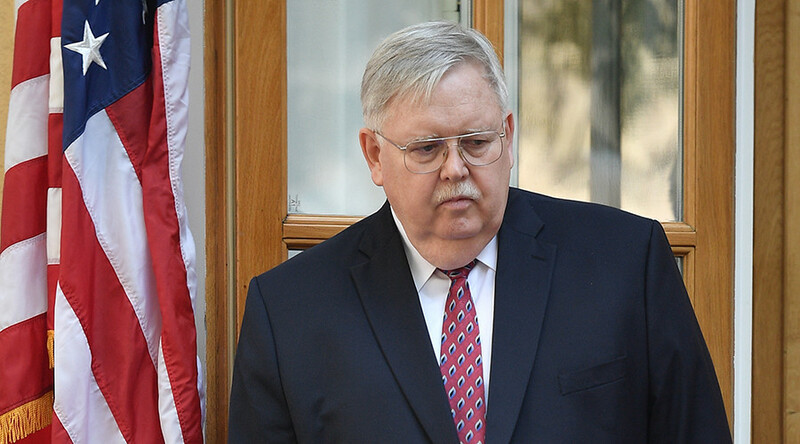 Tefft referred to Moscow’s decision to reduce the number of US diplomats in Russia to 455 by September 1, as well as the suspension of the use of all storage facilities by the US embassy as of August 1. The move came following US lawmakers’ decision to approve a new round of sanctions against Russia. While the bill - which targets Russia’s major defense, mining, shipping and railway industries - still needs US President Donald Trump’s approval to become law, Moscow considers the Senate’s decision as almost final. Moscow has also reserved the right to impose additional retaliatory measures in the event of new steps by Washington, warning that they could affect US interests. Russia’s deputy foreign minister, Sergey Ryabkov, met Tefft on Friday to deliver the statement from the Foreign Ministry on the reduction of diplomatic staff and US diplomatic compounds. Russian Senator Konstantin Kosachev said that Moscow’s reaction is adequate, balanced and relevant to the current sorry state of bilateral relations. “We did everything we could to save relations from collapse but the Americans did just the opposite,” Kosachev wrote on Facebook.